It's been a few years since I last did a 'secondhand bookshops wot I visited on holiday and the books wot I bought' post, for the simple reason that it's been a few years since I've been on a holiday where visiting secondhand bookshops and buying books was any kind of prospect. Happily, last week's week-long excursion to the Isle of Wight presented a number of opportunities for browsing in bookshops, and knowing how much my largely imaginary audience has enjoyed previous accounts of my ridiculous holidays, I decided I'd document the books-related bits of this one too. You're very welcome, my nonexistent readership. 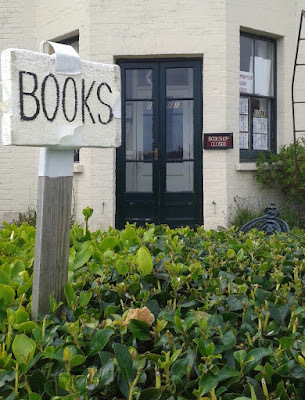 Before we got the ferry over to the Isle of Wight I established (via Inprint's Bookshop Guide) that there are eight secondhand bookshops dotted about the island. Given that this was supposed to be a holiday and not merely a flimsy excuse for my seeking out secondhand bookshops, I thought it unlikely I'd get to visit more than a couple, but in the end, to my surprise, I managed to make it to half. 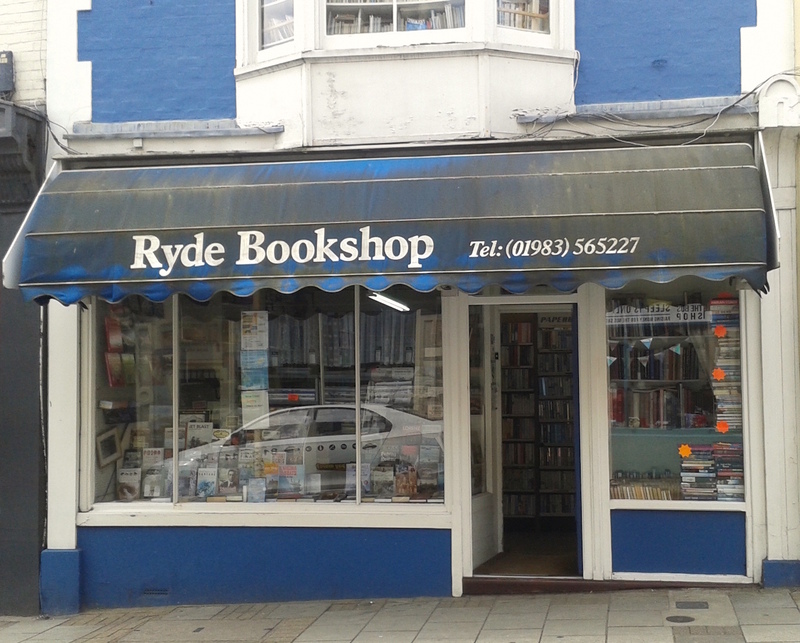 (It would've been more but Babushka Books in Shanklin was inexplicably shut when I visited. 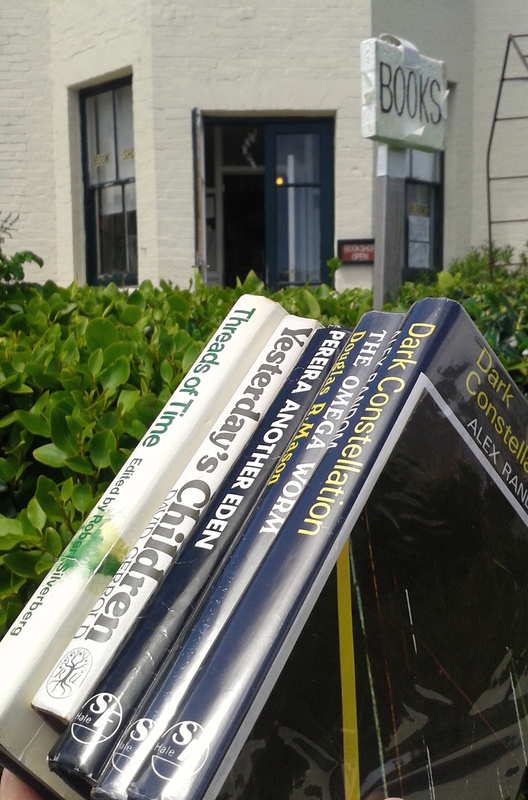 Or maybe not so inexplicably, considering the vagaries of secondhand bookshop opening times.) 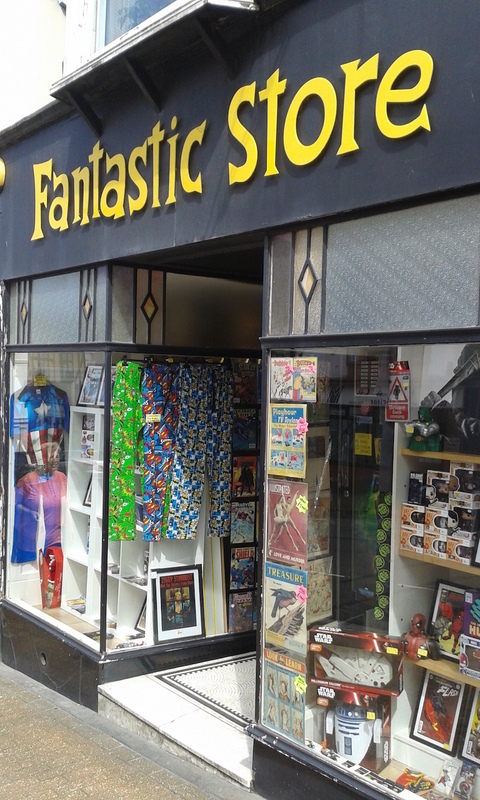 However, by far the biggest haul of books came from a comic shop. First port of call was the Mother Goose Bookshop on the village green in St. Helens, on the east side of the island. I only had a limited amount of time to investigate as we were on our way to the seaside town of Ryde, a little further up the coast, but it was a sizeable shop with an extensive stock of modern firsts (and plenty of non-fiction too). 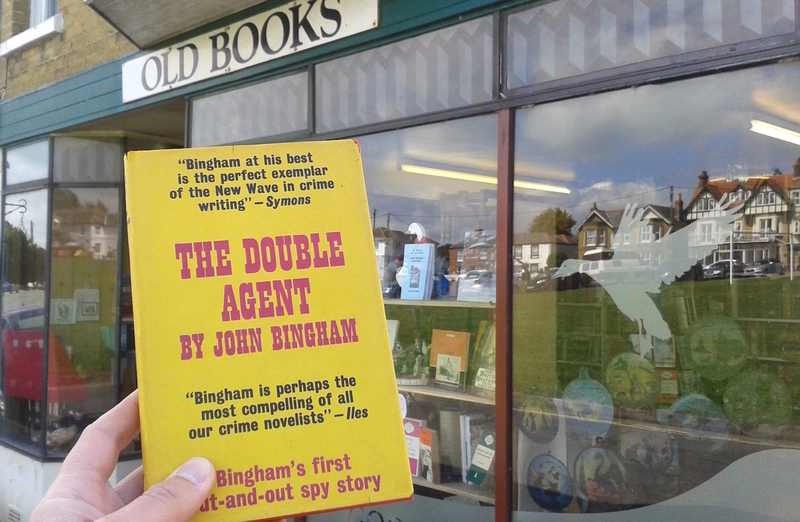 After a survey of the shelves I located in the crime and thriller section a first edition of The Double Agent (Gollancz, 1966), the first spy novel by ex-spy (and reportedly the inspiration for George Smiley) John Bingham – a book I've had on my list for quite some time. 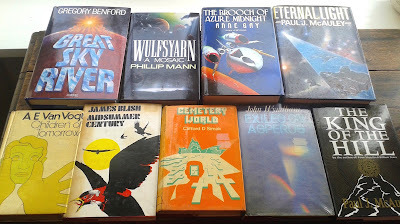 Top row left to right: a US first edition of Gregory Benford's Great Sky River (Bantam/Spectra 1987, jacket by Roger Bergendorf), the third novel in Benford's Galactic Centre Saga – the first being In the Ocean of the Night, which I bought online few weeks ago; a first edition of Wulfsyarn by Phillip Mann (Gollancz, 1990, jacket by John Brettoner); a first edition of The Brooch of Azure Midnight by Anne Gay (Orbit, 1991, jacket by Fred Gambino); and a first edition of Eternal Light by Paul J. McAuley (Gollancz, 1991, jacket by John Brettoner again), the third and final novel in McAuley's Four Hundred Billion Stars Series – the first being Four Hundred Billion Stars itself, which again I bought online a few weeks ago. Bottom row left to right: A. E. Van Vogt's Children of Tomorrow (Sidgwick & Jackson, 1972); James Blish's Midsummer Century (Faber, 1973); Clifford D. Simak's Cemetery World (Sidgwick, 1975); John Wyndham's Exiles on Asperus (Severn House, 1979), and Paul J. McAuley's short story collection The King of the Hill (Gollancz, 1991). 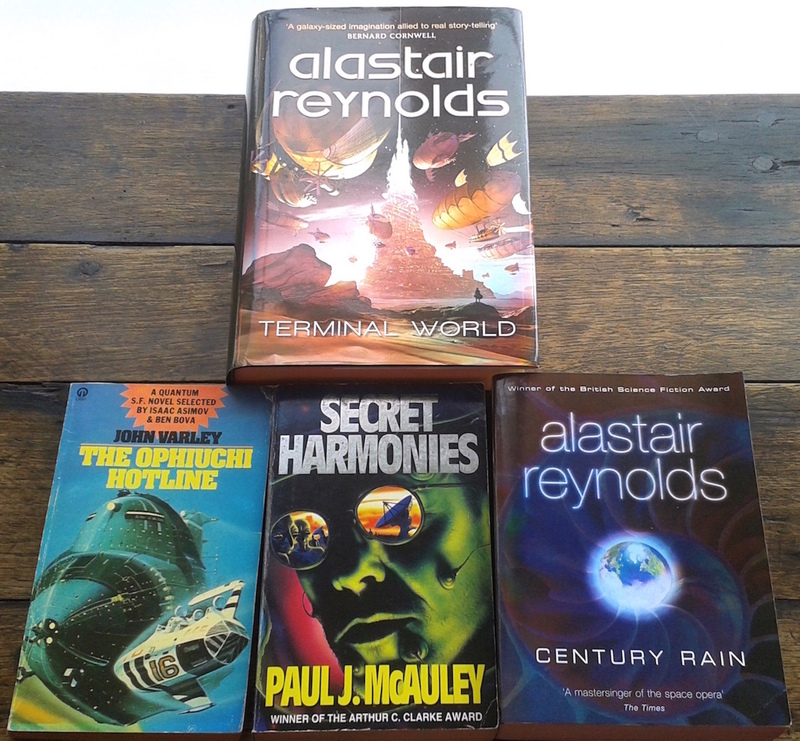 A first edition/printing of Alastair Reynolds' Terminal World (Gollancz, 2010); a first paperback edition of John Varley's debut novel The Ophiuchi Hotline (Orbit/Futura, 1978; I already had a Sidgwick & Jackson hardback first, but I couldn't resist that Chris Foss cover); a 1997 Vista paperback of Paul J. McAuley's Secret Harmonies (originally 1989, and the second in the Four Hundred Billion Stars Series), and a first paperback edition of Alastair Reynolds' Century Rain (Gollancz, 2005). ...it was shut. Curses. Fortunately we were able to make a return visit the next day, and even more fortunately this time it was open! Top row left to right: Dark Constellation by Alex Random (Robert Hale, 1975); The Omega Worm by Douglas R. Mason (Hale, 1976), and Another Eden by W. D. Pereira (Hale, 1976). 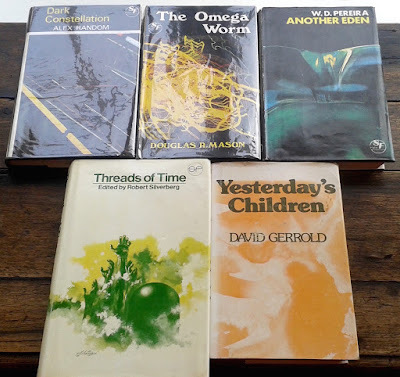 Bottom row: Threads of Time (Millington, 1975), edited and introduced by Robert Silverberg and containing novellas by Gregory Benford (Threads of Time), Clifford D. Simak (The Marathon Photograph) and Norman Spinrad (Riding the Torch); and Yesteday's Children by David Gerrold (Readers Union, 1975). Sounds like a great vacation! I love seeing other book lovers' finds. They remind me of books I liked, books I've missed out on and books I might enjoy. Thanks. Have fun with the new volumes. Usually I feel disappointment when I see the books they have on their shelves, but occasionally I come across something good. 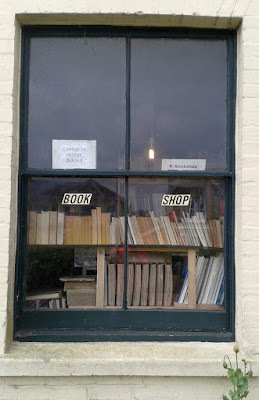 There are some decent ones in Lewes, which I check out when I can. How do you find them your way? If I want to dump surplus books I take them to King Street, Hammersmith where they aren't too fussy. 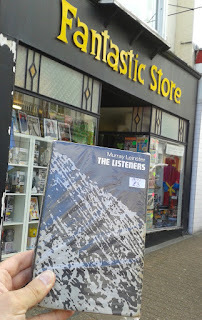 To buy, Oxfam in High Street Kensington is excellent. I recently had some success during a holiday in Wales; Pembroke and Llandeilo. 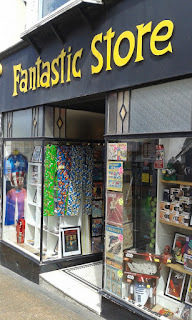 I shall bear High Street Ken in mind next time I'm in London. Thanks for the tip! Nonexistent readership? 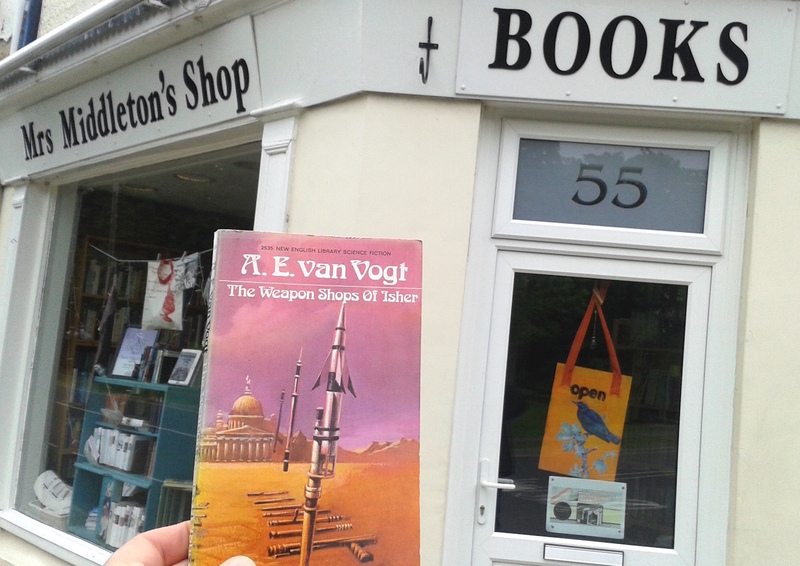 I lap up your rare bookshop excursion - and I was very envious of your Robert Hale SF haul this time round. I collect these oddities. Keep up the good work! Thank you, Eric, that's very kind. I laughed at your description: "largely imaginary audience." Ha. The problem with these posts is that I am hugely envious. Of the books you buy, the condition they are in, and the fact that you can even find lovely used bookshops like this. Thanks Tracy! Now I just need to find the time to read some of the damn things.